How on earth do you make a no-bake gingerbread house? With graham crackers, of course! This is a really neat book for kids (alright, who am I kidding, for “big kids”, too!). It is well-written and illustrated. Not just for Christmas, there are designs for Easter, Halloween and even a Tiki hut! In order to give this book a fair review, my son and I HAD to try at least one of these designs. The recipe for royal icing is easy to follow (although mine did turn out a little runny…). Gluing graham crackers together is easier than it sounds. While mine didn’t turn out anything like the picture in the book, my son declared it “pretty cool”! 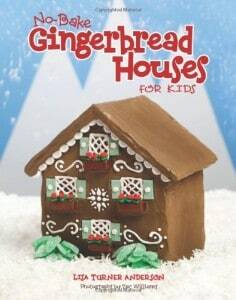 For families who enjoy spending time in the kitchen and playing with their food, I recommend this book for the good time you can have trying to figure out if that piece of candy belongs on the house or in your mouth. It might be a good idea to buy extras of the trimmings… I think I’ll buy a bigger bag of spearmint leaves next time. We’ll have to try another design for his Halloween party at school. The hardest part will be deciding between Dracula’s castle or the Haunted Mansion. Myla is a life-long resident of Nova Scotia, Canada. She is married with two sons. A self-described bookworm, her hobbies also include knitting, painting, photography and music.